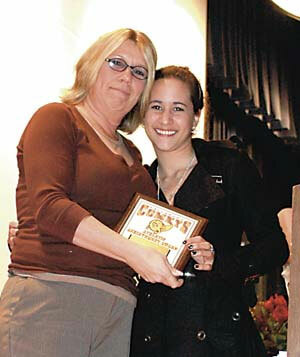 COACH PATTY SELETSKY presents the varsity cheerleading team’s Sportsmanship Award to Heily Flores. FALLSBURG  March 25, 2008  The Fallsburg Central School District Board of Education and the Fallsburg Booster Club sponsored a winter athletic awards program last Wednesday night in the high school auditorium to recognize dozens of student-athletes for their accomplishments during the 2007-2008 season. Coaches from the 11 Fallsburg teams which competed this winter introduced the members of their team and called them up on the stage. In addition to thanking their players for working hard at practices and games, many of the coaches also praised parents and community members for supporting their teams. More than one coach noted at some away games, the Fallsburg team had more fans in attendance than the home team did. Girls’ varsity basketball Coach Frank Godlewski, who is a Fallsburg High School Assistant Principal thanked fellow Assistant Principal David Viglione and High School Principal Mark Plescia for all of their understanding and assistance this season. Godlewski noted that Plescia and Viglione filled in for him at meetings and events when he and the Lady Comets had a practice or a game that same afternoon or evening. Godlewski lauded his players for their improvement this season. The Lady Comets won two games this season after not recording any victories during the 2006-2007 season. He smiled as he spoke about the team members dying his hair pink following their season-opening win against Rhinebeck back in December. “I’m looking forward to next year,” Godlewski said. Carey, who coached the boys’ alpine ski team spoke about her team as well as the girls’ alpine ski team. As has been the case for the past several seasons, both squads included student-athletes who attend Fallsburg High School and student-athletes who attend Tri-Valley High School. Carey said that the boys’ and girls’ teams each finished third in the Orange County Interscholastic Athletic Association (OCIAA) Division I standings this season. The boys’ team posted a 30-12 record and the girls’ team had a 24-12 record. She noted that senior Chris Egenes placed sixth at the Section IX ski meet and therefore qualified for the New York State Public High School Athletic Association (NYSPHSAA) Alpine Ski Championships at Whiteface Mountain in Lake Placid. At the state meet, Egenes placed 12th in the slalom and 22nd in the giant slalom. “He did very well at the state meet and was invited to join the New York State boys’ team at the USSA Northeast Championships in New Hampshire,” Carey said. The prestigious event to which Carey referred, the United States Ski and Snowboard Association (USSA) Eastern High School Championships, was held March 14-16 at Cranmore Mountain in North Conway, New Hampshire. The 10-member New York State team placed second at the event. Carey praised Egenes for being “there to help out,” noting that he often took the time to assist younger skiers at meets this season. Boys’ Varsity Alpine Ski Team (Coach Janet Carey, Coach Stacy Swornik): Wesley Castillo (SHR), Christopher Egenes, Sebastian Sarmiento (HR), Uddhava Stowell (SHR), Dylan Vazquez, John Bernstein (SHR), Weston Currey (SHR), Jaxon Denman, Ryan Erts (HR), Matthew Garigliano, Gregory Knox (SHR), Joseph Mickelson (SHR), Ryan Mickelson (SHR), Gavin Perrella (SHR), Nick Perrello (manager).